Review Conquering Procrastination for 30 full days! Listen to the advice Dr. Fiore reveals throughout a mixture of live audio excerpts and studio recordings. You'll also receive a PDF workbook featuring the secrets to applying Dr. Fiore's techniques and strategies to your life by using a set of simple exercises. 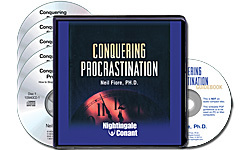 Please send me Dr. Neil Fiore's 6-CD audio program Conquering Procrastination: How to Stop Stalling and Start Achieving, PLUS PDF workbook for $39.95 which is $40 OFF the regular retail price.